Friday’s holiday-shortened session provided ample time for bulls to get their butts kicked. It’s unusual to see stocks get whacked the day after Thanksgiving, but perhaps such occurrences will become the norm as this bear market unfolds. If it proves to be as extraordinary as the bull market that preceded it, we shouldn’t be surprised to see bad days that are uglier than even old-timers can remember. Friday was not so bad, actually, considering that crude oil fell by nearly $5 a barrel. The Dow was down a measly 178 points in sympathy, suggesting that those who bought the dip, providing modest support, were too stupid to panic. 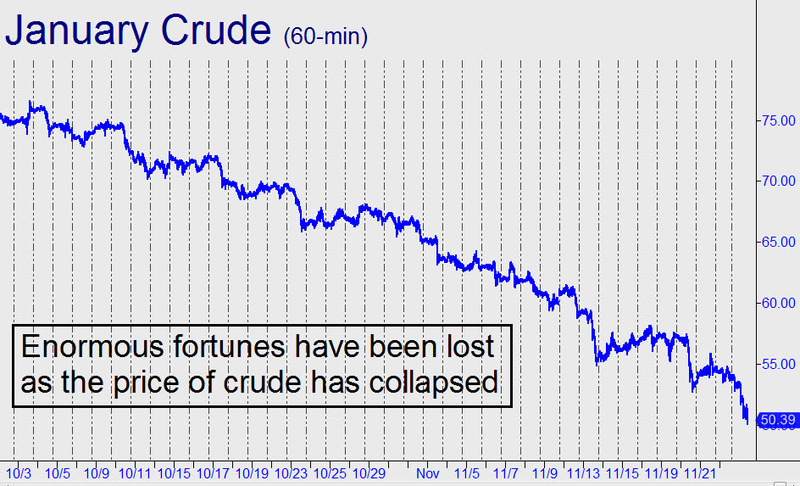 Enormous fortunes have already been lost as the price of crude has collapsed from $76 to $50 in less than two months. The energy sector was where the big money went in search of leverage after the real estate collapse of 2007-08. Now that bet is imploding, generating a whiff not only of a global economic downturn that has been gathering strength and which will soon engulf the U.S., but also of a catastrophic debt deflation that has grown increasingly likely since the late 1970s. The Fed will tighten one last time in December, just to be seen as walking the walk. The central bank’s final turn of the screw will be perceived eventually as the straw that broke the camel’s back, but at least the markets will not have tightening to worry about as they continue to fall. To give Trump his due, he has adroitly set up the Fed as the fall guy for the coming recession — not that there is ever anyone else to blame for America’s insane boom-and-bust cycles. Historians will debate whether the Fed was too tight, but a much more important question — i.e., Why do we even need a Fed to continuously inflate our currency? — will go unasked. Where is Ron Paul when you need him? Click here for a help page needed as a Hidden Pivot Graduate. The consistent accuracy of Rick Ackerman’s forecasts is well known in the trading world, where his Hidden Pivot Method has achieved cult status. Rick’s proprietary trading/forecasting system is easy to learn, probably because he majored in English, not rocket science. Just one simple but powerful trick -- managing the risk of an ongoing trade with stop-losses based on ‘impulse legs’ – can be grasped in three minutes and put to profitable use immediately. Quite a few of his students will tell you that using ‘impulsive stops’ has paid for the course many times over. Another secret Rick will share with you, “camouflage trading,” takes more time to master, but once you get the hang of it trading will never be the same. The technique entails identifying ultra-low-risk trade set-ups on, say, the one-minute bar chart, and then initiating trades in places where competition tends to be thin. Most important of all, Rick will teach you how to develop market instincts (aka “horse sense”) by observing the markets each day from the fixed vantage point that only a rigorously disciplined trading system can provide. The three-hour Hidden Pivot Course is offered live each month. If it’s more convenient, you can take it in recorded form at your leisure, as many times as you like. The course fee includes “live” trading sessions (as opposed to hypothetical ‘chalk-talk’) every Wednesday morning, access to hundreds of recorded hours of tutorial sessions, and access to an online library that will help you achieve black-belt mastery of Hidden Pivot trading techniques. The next webinar will be held on Tuesday, April 23. Click below to register or get more information. Tidal Wave of Easy Money About to Crest? Hey, You Inflationistas: Was That Your Best Punch? All Contents © 2018, Hidden Pivot Enterprises. All Rights Reserved. This site is for information purposes only and should not be considered personalized investment advice or a solicitation to buy or sell any securities. This material does not take into account the investors particular investment objectives, financial situations or needs, and is not intended as a recommendation of particular securities, financial instruments or strategies to any investors. Before acting on any recommendation in this material, the investor should consider whether it is suitable for his/her particular circumstances, and if necessary, seek professional financial and/or tax advice. Investments based upon options strategies can involve significant risk and may lose money. Rick's Picks gives no express or implied warranties of any kind, including, but not limited to, any warranties of merchantability or fitness for a particular purpose or use. In no event shall Rick's Picks be liable to any person or entity for any liability whatsoever or any direct, indirect, special or consequential damages in connection with or resulting from any use hereof. Analytic services and products provided by Rick's Picks are the result of separate activities designed to preserve the independence and objectivity of each analytic process. Rick's Picks has established policies and procedures to maintain the confidentiality of non-public information received during each analytic process. Investing in stocks, bonds, option, futures and other financial instruments involve risks and may not be suitable for everyone. Prior to buying or selling an option, a person must receive a copy of Characteristics and Risks of Standardized Options. Copies of this document are available at CBOE or from your broker. Copies are also available from the Chicago Board Options Exchange, 400 S. LaSalle Street, Chicago, IL 60605. The OCC Prospectus contains information on options issued by The Options Clearing Corporation. Copies of this document are available from The Options Clearing Corporation, 440 S. LaSalle Street, 24th Floor, Chicago, IL 60605 or the Chicago Board Options Exchange, 400 S. LaSalle Street, Chicago, IL 60605.The documents available discuss exchange-traded options issued by The Options Clearing Corporation and are intended for educational purposes. No statement in the documents should be construed as a recommendation to buy or sell a security or to provide investment advice. All stocks, bonds, mutual funds, options, futures and other financial instruments shown are examples only, meant for educational purposes. These are not recommendations to buy or sell any security. Any pricing or potential profitability shown does not take into account your trade size, brokerage commissions or taxes which will affect actual investment returns. Investment examples and comments presented are solely those of the author, analysts, experts, or information source quoted. They do not represent the opinions of Rick's Picks on whether to buy, sell or hold shares of a particular stock or option. Investors should be cautious about any and all stock, futures or option recommendations and should consider the source of any advice on stock, future or option selection. Various factors, including personal, fund or corporate ownership, may influence or factor into an experts stock analysis or opinion. All investors are advised to conduct their own independent research into individual stocks before making a purchase decision. In addition, investors are advised that past stock, future or option performance is no guarantee of future price appreciation or depreciation. Those involved with the preparation and distribution of this report may have had in the past, currently hold, or may purchase in the future stock and/or options in companies discussed in these reports. It is expected that the limited distribution of these reports to a relatively small number of investors will not materially affect the price of a stock, options or future. Website Management by BLC Technologies, Inc. Copyright © 2019 Hidden Pivot Enterprises.. All Rights Reserved.